A lot has been written in recent months about "transparency" in investing, most of which has been in reference to charges. When we buy an actively managed fund we are usually limited to the "Investment Objectives" mission-statement plus a list of the top ten holdings on which to base our decision, with historical fund and fund manager performance statistics added into the mix. Full listings of fund holdings are usually available at periodic intervals, but they are not widely published and are not easily accessible, particularly to investors who have not already "bought into" the fund in question. What the average investor has to go on is little more than Brandon and Lori have as they peek into the next container and speculate as to what is under the sheets. However Neil Woodford has been in the news recently (yet again) as he has promised to disclose his entire portfolio and make it easily accessible to all. Perhaps this means that there will be a sea-change towards transparency from fund managers. It does seem to be a move in the right direction as a "sheets off" approach in all aspects of the finance industry can only be good for investors who want to be able to make informed decisions. After all , we do need to be able to see exactly what we are putting into our pots in order to be able gauge its effect on the mix. and "sight unseen" should perhaps be one investment risk we could be avoiding. It'll be interesting to see what's in the portfolio! It will indeed, even for those of us who haven't bought in. 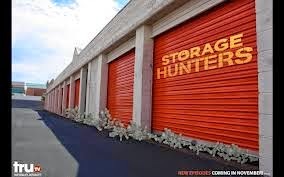 Oh and I've caught 'Storage Hunters' a few times - as you say, 'manufactured' for reality TV but nonetheless quite addictive watching!